Throughout my 14 years working in seven different newsrooms, I have witnessed a dearth of diverse perspectives, among photojournalists as well as photo editors. I’ve found myself the lone woman and the only black person in a newsroom or in the cadre of mostly white male editors choosing which images will make that day’s web or print publication. In August 2014, I was a freelance photo editor at an international newsmagazine. One of the week’s major news stories was protests in Ferguson, Missouri, following the police shooting of Michael Brown. One photo we considered showed a tall man—handgun tucked in his waistband and face wrapped in a shirt leaving only his eyes visible—looting a gas station in Ferguson. We were also considering a shot of several protesters in the rain, their mouths open mid-yell and hands stretched high above their heads in the “Hands up, don’t shoot” position. Despite the emotional pull of the second image, several editors expressed preference for the looting photo because of the subject’s intensely direct gaze. The image of the looter exemplified the kind of stereotypical depictions of black Americans as criminal and suspect still so prevalent in news media. Despite my frustration at the reminder of how insidious implicit bias can be, even among the well-intentioned, I chose not to verbalize that particular point. Thankfully, with almost immediate unanimous agreement, my colleagues selected the image of rain-soaked protesters and moved onto considering images for other stories. My experiences are not unique, and the problem is not just domestic, but international. In 2015 and 2016, World Press Photo (WPP) surveyed nearly 2000 news photographers from around the globe, and reported that only 15 percent of the photographers were female, and 65 percent were from Europe, the United States and Australia. In other words, the dominant point of view through which the entire world continues to see and understand itself is that of Western men. Meanwhile, the WPP surveys have so far gathered no statistics on the photographers’ racial identities, which is a reflection of how the issue of racial diversity in the field of journalism—which is deeply felt by some of us—has avoided analysis and critique for far too long. It’s this singular visual perspective—male, Western and white—that Ecuadorean photojournalist Emilia Lloret sees as the central problem with a lack of diversity among photojournalists. “Instead of being a tool for social change…it becomes a tool of oppression, perpetuating clichés and crippling stereotypes like the ‘violent and dangerous’ Latin America, the ‘flies-in-the-eye malnourished child’ in Africa,” says Lloret. Bangladeshi photographer Shahidul Alam recalls an international exhibition he attended where “all the photographs were taken by white Western photographers.” Their photographs depicted poverty as the primary identity of the subjects. “Other aspects of a person’s life seemed to be secondary, or absent. These were people to be pitied and saved,” Alam says. “The history of colonization, exploitation, unequal trade terms and racism, were absent in both the images and the text. “The solution is simple,” Alam continues. “A local photographer is likely to be culturally and socially more attuned, linguistically more able, and politically more aware, than a visiting photographer. These are pluses.” In 1998, Alam founded a school in Dhaka, Pathshala South Media Institute, whose alums have been honored by World Press Photo, won Alexia grants and been invited to Joop Swart Masterclasses. In the U.S., the lack of diversity in photojournalism parallels the international problem: Newspapers and websites are filled with images of black and brown people struggling for racial equality and civil rights, but those behind the images rarely share similar identities and experiences. One of the stumbling blocks to newsroom diversity is class disparity, which is connected to racial disparity. Those who have access to elite schools, financial security and networks in newsrooms are more likely to succeed. And aspiring photojournalists who have the economic resources to purchase camera equipment, keep up with rapidly changing technology and self-fund photo projects abroad are more likely to win recognition and assignments. In short, the economically advantaged—who are more often white than black or Latino—have a leg up in journalism, as they do in other professions. Brent Lewis, photo editor at ESPN’s The Undefeated, says recognizing there is a problem is the first step. “Being aware that when trying to cover stories in the vein of black life, you probably should have someone who actually lived it. You need to have insight from someone who understands that realm,” he says. When both photographers in the field and photo editors in the newsroom are primarily white and male, news images will reflect that singular perspective. Media critics have often decried the overemphasis on violent black protesters—images that tend to play into the ever-present stereotype of blackness that finds its origins in post-slavery propaganda. In many a newsroom there is a predilection to depict black American neighborhoods beset by police violence as war zones, and too little critical conversation about it to affect change. Rare is the published image that highlights peaceful protesting en masse and black communities working harmoniously. Yet it is precisely those photographs—evincing empathy rather than paternalistic sympathy—that capture the collective imagination. 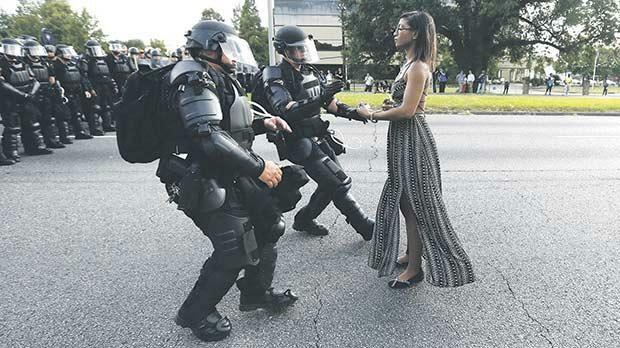 For instance, photojournalist Jonathan Bachman’s viral image of Ieshia Evans facing off with Baton Rouge police is part of a long photojournalistic tradition: a solitary individual standing up to the horde of authority. It humanizes rather than demonizes the subject—in this case a black woman—and a cursory search of newswire photos of various Black Lives Matter protests indicate moments of solidarity and community are just as readily available as depictions of rage and violence. The narrative is the responsibility of both photographers and photo editors, but it’s the latter who have the final say over how visual stories are told. Unfortunately, there are few people of color and even fewer women of color in news photo editor roles. A 2016 American Society of News Editors survey reported that only 13 percent of newsroom leaders were minorities and that black and Latina women represented 2.2 percent and 1.45 percent of news leadership, respectively. Meanwhile, the U.S. Census Bureau’s statistics put black and Latino citizens at 31 percent of the population. A number of individuals and organizations are trying to help them with that. One of the most visible and successful challenges to the status quo of visual narrative is Everyday Africa (EA), founded by Peter DiCampo and Austin Merrell. They recognize that everyday life in Africa is at odds with the stereotypical images of poverty, war and illness that shape outsiders’ perceptions. So they launched EA with a mission to create “new generations of storytellers and audiences that recognize the need for multiple perspectives in portraying the cultures that define us.” EA’s work has been vitally important in addressing both the nationality and racial disparities of photojournalists—many of the contributors are local photographers—and the “Everyday” model turned out to be compelling and so resonant to social media audiences that it is now being imitated throughout the world. World Press Photo has also taken steps to diversify the international pool of photojournalists. It is trying to recruit more female jurors for its annual competition. Also, to provide training and networking opportunities for emerging photographers outside Europe and North America, WPP now runs regional master classes in Mexico City, Nairobi and elsewhere, similar to the Joop Swart Masterclass held annually in Amsterdam. WPP has also partnered with Everyday Africa to create the African Photojournalism Database (APJD), now representing hundreds of photographers across the continent. And both EA and APJD are on Blink, a marketing platform for visual content producers, so APJD photographers are getting recognition and assignment opportunities they previously lacked. Last year, Latin American photo editor Laura Beltrán Villamizar left a curatorial position at World Press to co-found Native Agency to represent photojournalists in Latin America and Africa. She had been impressed by the talent of young photojournalists she’d met at a WPP master class in Mexico City, and realized they lacked access to a client base or the professional resources to market their work effectively. Native Agency’s mission is to help close those gaps. Here in the U.S., ESPN’s Lewis is building a database of editorial photographers of color. He was motivated by how few black photographers are hired for editorial work. His goal is to make it easier for other photo editors to find and hire photographers of color, and thereby diversify the visual perspectives of their publications. Providing opportunities to minorities and non-Western photojournalists must become a goal of the entire industry. Where we fail to address inequities in our ranks, we fall prey to the dangers of a single, Eurocentric narrative, and compromise our credibility. But there is good work being done, there are strides being made. Now that work must step out of the margins, expanding until it is the norm rather than exception. Documentary photographer and filmmaker Tara Pixley is completing a PhD at UC San Diego. In 2016, she was a Knight Visiting Nieman Fellow at Harvard. Portions of this article appeared in Newsweek and Nieman Reports.